If the name Party Casino sounds familiar to you, it's with good reason. That's because Party Casino is part of the multi-million pound Party Gaming group, which brings us one of the world's biggest poker networks, and also a few bingo sites. Party Casino launched in 2006, and has a long and illustrious history. This vast slots site is owned by bwin.party Digital Entertainment, which is the world's biggest listed online gaming business. This was created when two gaming titans clashed in March 2011. Currently, the Party Group has four main areas; poker, slots, live dealer casino, and Foxy Bingo. Considering the site has such a large group behind it, you may find the homepage little sterile and disappointing. It's nothing but plain blue and white text, with very little in the way of flashy graphics. Still, it's easy to navigate around, and the jackpot ticker scrolling across the page should catch your eye. There are several ways to play at Party Casino – you can either quick play, download, or play on your mobile. To access live dealers, you will need to make the download. The mobile version offers around 20 different titles, and tends to focus on blackjack and roulette. The quickest way to get started with your mobile casino is to scan the QR code. Games are broken up into several broad categories including jackpot slots, video poker, roulette, blackjack, live dealer, and new games. Slots have up to 25 pay lines, and five reels – they feature anything from blockbuster movies to videogame times, and plenty of classic games as well. You can play all games in demo mode first, which is advisable before you deposit. Titles include Birds of Paradise, Aztec Gold, Dolphin Reef, Coral Cash and Manchester United. At time of press, which was August 2013, one Party Casino player had won a record breaking £1.4 million jackpot, which is the biggest-ever mobile casino jackpot in history. Slots, live casino, blackjack, roulette, Marvel Slots, video poker, raffle jackpot. Sterile, simple and a tad bland. As a Palladium club member, you can benefit from cash bonuses, top name gifts, and an augmented comp point conversion rate. Visa, Maestro, Neteller, PayPal Casino Sites, Ukash, Skrill, Wire Transfer. Party Gaming is guaranteed safe and secure, and has an eCOGRA certificate of approval. Games are tested for fairness, and all outcomes are entirely unpredictable, thanks to sophisticated random number generator technology. 128 bit encryption is provided by Thawte Security to guard your data. 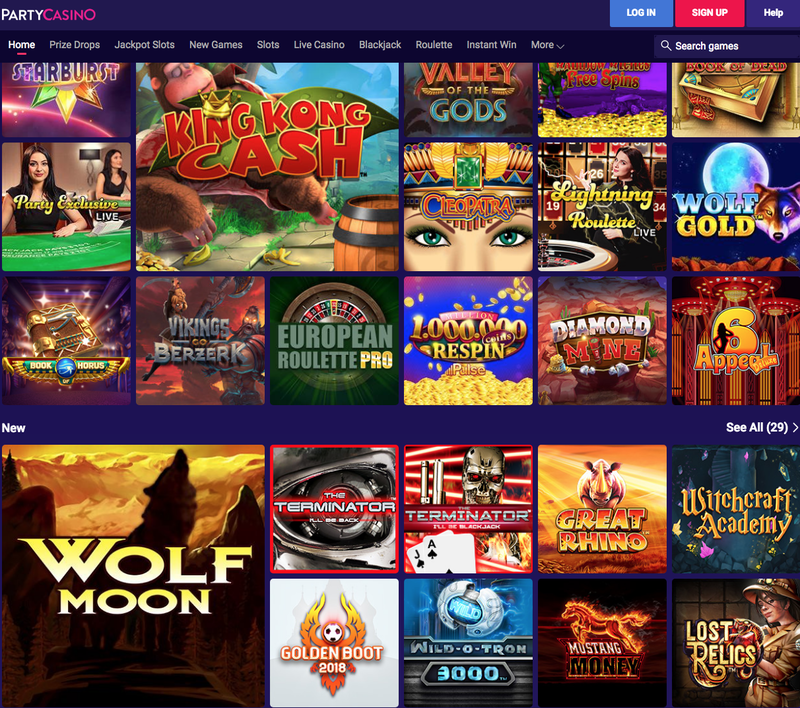 Despite its austere home page, Party Casino has a fine heritage indeed. It's owned by bwin.party Digital Entertainment plc, which was created when bwin and Party Gaming merged in March 2011. The company is licensed by the Government of Gibraltar, and regulated by the Gibraltar Gambling Commissioner. Millions of adults enjoy online gaming, but for a very small percentage, it can become a problem. If you think you're developing an addiction, seek counselling and consider self exclusion.